Elida Middle School’s Track hosted a mini-Relay for Life organized by the Elida High School Student Council and the Good Vibes Club at the school. June 1 — Relay for LIfe of Lima - 6 p.m. - midnight at Spartan Stadium, Lima. June 8 — Relay for Life of Putnam County - 6 p.m. - midnight at Ottawa-Glandorf High School, Ottawa. June 15 — Relay for Life of Delphos - 6 p.m. - midnight at Stadium Park, Delphos. July 13 — Relay for Life of Hardin County - 6 p.m. - midnight at downtown Kenton. ELIDA — Most everyone knows someone affected by cancer. Students in Elida schools have been raising money for the American Cancer Society through a mini-Relay for Life for nearly a decade. “My family personally has been impacted. My mom has had cancer. About two years ago, she was diagnosed, and right now she’s considered [to have] no evidence of disease, but it’s still there, and we can’t say she’s cancer-free. I’ve done this since I was a freshman, and I know how well it does impact a lot of people. It just means a lot to me, personally, and for the community to get involved in this kind of stuff,” said Jordan Crates, one of the co-organizers for the relay. “It’s just a sad thing that people lose people to cancer, and it’s always just really sad. I actually lost my grandpa to cancer, and it was really upsetting. My uncle had it and he actually was able to recover from that. That’s just awesome to see,” said Samantha Finnerty, another co-organizer of the Relay. 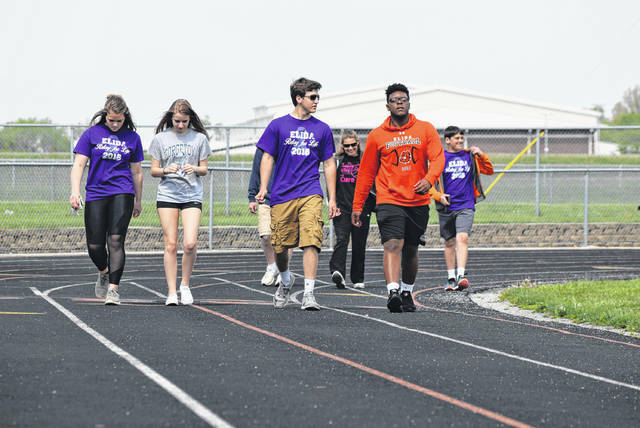 Students and community members came out to the Elida Middle School track Saturday to participate in the relay. People could walk around the track or frequent any of the booths set up on the infield. “Each grade has at least one booth. Some grades have more than one. I know Jordan, herself, actually has two, and she’s doing a great job with that. There’s just a lot of participation in the school. A lot of our people right now are at the school and we have people from our actual community, and it’s just great to see that,” said Finnerty. “All of our money will go straight to the American Cancer Society [with the] hopes to find a cure for cancer one day,” said Finnerty. “It’s great because as a community, we know that cancer can impact a community and hit everybody pretty hard. So we just wanted to get the school together just so that everyone and the community can see we’re here supporting it. We know the impact it can have, and we want to try and make a difference and help out where we can,” said Krissa Worley, student council advisor. https://www.limaohio.com/wp-content/uploads/sites/54/2018/05/web1_Elida-Relay-toned.jpgElida Middle School’s Track hosted a mini-Relay for Life organized by the Elida High School Student Council and the Good Vibes Club at the school.